Any Colour You Like As Long As It's Black- The Planet X Bike Box. Anyone who's ever ridden around the Peak District, or anywhere else in Yorkshire for that matter, knows that it's the best place in the world to ride your bike. Sure, Italy might have some nice scenery and a decent cup of coffee, France might have some filled baguettes and one or two classic climbs to its name, but neither of them has owt on Yorkshire. Apparently, however, not everyone agrees with us. Some cyclists will go to almost any lengths to travel the globe and pit themselves against the most famous roads in the world on their own bike. OK, we admit it, we can see the attraction too. We understand the urge to fly halfway around the world to beat the Strava time that one of your mates set up the Col Du Galibier last year. So the issue is, do you risk hiring a knackered old unloved bike from the local Pedal'O or do you take your pride and joy with you? If you're like us, odds are you'd be wanting to take your own bike with you. If you're travelling to race then there's no doubt about it, you have to take your own bike. 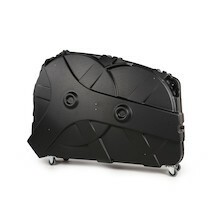 So for everyone who ever wanted to travel with their own bike we've designed the Planet X Bike Box. We've built our Bike Box to be versatile, it'll fit Road and TT bikes up to 62cm, there's space for 26", 650b and 29" MTBs. Remove your tyres before you fly and there's even space for plus size 29ers. You can even travel with one of our 8" travel S36 Downhill bikes in the box. Sadly you can't squeeze a Fat bike in there- those 80mm wide rims are just too much. We've built it to be tough. There are no pop-rivets on our box. Everything is bolted in place and fastened with stainless steel or Nylock nuts. We sourced a full-length, custom-made, stainless steel piano hinge for the bottom of the box, with the thickest knuckle pin possible. To stiffen the box further we support each half of the hinge with a full-length alloy runner. Five custom locking latches hold everything together and there are two extra through-case loop points for added security when you travel. We build these to last. Designed right here in Sheffield we've sourced local components wherever possible. The thermoplastic shells are made in Yorkshire, the handles and straps are assembled in Sheffield, the anti-crush tubes and latch support tabs come from Chesterfield, the stainless mounting hardware is UK sourced and the foam liners come from just up the road in Tyneside. Each bike box comes with eight Velcro straps ready fitted, four per side. You can move them around the box as you see fit. If you need to locate one somewhere different to best suit your frame or wheels then it's no worries, just drill a new M5 hole in the shell and put a new slot in the foam liner to suit. We understand that there are a huge number of different bike shapes out there so have at it. Why only black? Because black costs less. We could have chosen a variety of different colours and averaged the increased price out over all the options- but that's not really fair to those who don't want colours. There's plenty of space on the shell if you feel the need to customize it, go crazy with stickers. We haven't thrown one off a viaduct, or out of a speeding van because that would be stupid, and we haven't given loads of them away to pro-cyclists, or spent a wad on advertising them, so you're only paying for the one that you're buying. What we have done is spent ages getting them right, making sure they offer as much protection and versatility as possible. We've tried our level best to have as many parts as humanly possible made right here in the U.K and we've kept the price rock bottom- just like you'd expect. Keep your bike safe and sound with the Planet X Bike Box. Special Introductory Offer. £50 off when you use PRBIBO50 at Checkout, Limited to the first 20 Customers.